It’s the happy-go-lucky 3 Amigos (in play since we began this goofy metaphor last fall), which would signal macro changes to come. When you are talking about the macro however, things move slowly and to date, only one of our riders has made it to his destination. 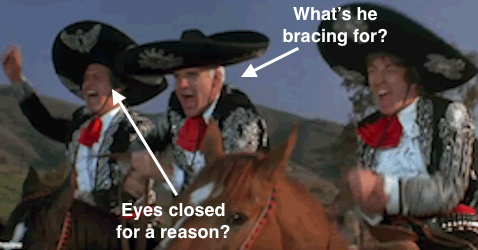 To review, they are Amigos 1-3, Chevy, Steve and Martin. Below we’ll review a daily (short-term) and monthly (long-term) chart of each to check the status. We noted Amigo #1’s eyes closed as stocks vs. gold took a big plunge in early February and again in March. This has actually set a lower highs, lower lows downtrend in 2018, and the swings have been very dynamic. Right now we are on an up swing and if you are a gold bug and this ratio rises above the March high please prepare to take caution, as the macro would be moving against you, at least relative to risk ‘on’ assets. But for now the lower highs and lower lows daily trend is intact. The big picture uptrend in SPX/Gold remains intact and our upside target is higher still, at around 2.5 which, while not shown on this chart is roughly a 38% Fib retrace from the 2011 low. 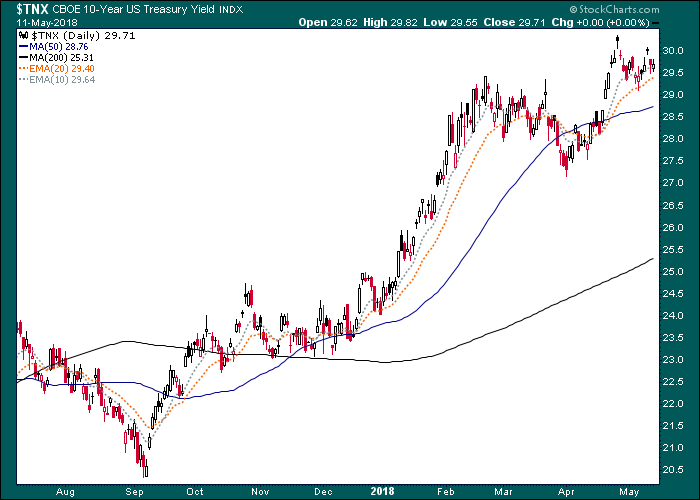 We have noted that taking out the September 2017 low (shown above) would put cyclical players on notice for bad things to come. The ratio has not threatened that level. We are still cyclical and risk ‘on’ by this measure. But if the daily chart’s down trend resumes trend changes would have to start somewhere and that somewhere is a daily chart. It has not been rocket science. 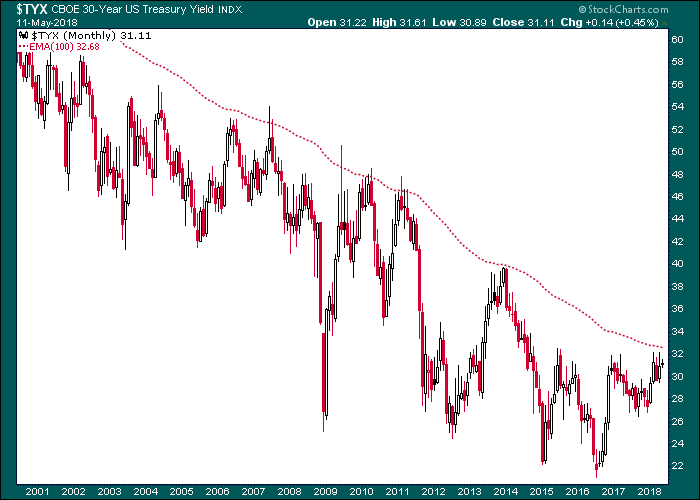 Ever since we established the Continuum ™ as a way not to get fooled by the financial media and the hysterical news of the day, the 30 year yield and its monthly EMA 100 limiter (red dashed line) have been a simple guide about when to have caution on a rising yields stance. After all, decades of consistent history should be respected, shouldn’t it? So I ask you to please consider whether the limiter will live up to its name and limit the move in inflationary hysterics and eventually risk ‘on’ market activity (as far back as October 2017 we had, after all, expected stocks and interest rates to climb together to the 3.3% limiter) or become a gateway to something very new and very off-the-hook with respect to a continuation of what has been considered ‘normal’ for decades now. Such a breakout may force a reevaluation upon casino patrons as to previous linear thinking about bullish and bearish bearish market forecasting. For now, Amigo #2 has dutifully ridden to his destination along with the risk ‘on’ trades, which remain intact. I am not going to pretend to lecture anyone on what will happen if it breaks through or if it is limited and fails again, for that matter (that will take ongoing management as we do in NFTRH). But changes will eventually come and they could be highly inflationary or quite the opposite, depending on which way yields go, in line with recent decades of history or on to a new trend. As for the daily view you can see a potential for a double top as the 30yr neared our 3.3% target (actually 3.27% per the limiter above). For all intents and purposes Amigo #2 has been bracing for a smash against the limiter (the 10yr ticked above target a while ago) and the daily situation should be watched to see if it is already in. A drop below 3.1% could signal an end to the move and a rise above 3.2% quite the opposite. 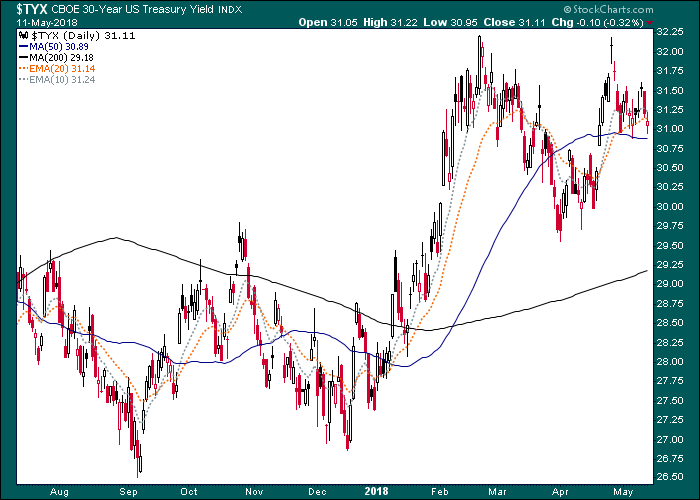 For reference, the daily 10yr yield has been the leader and it continues to appear in a higher rates stance. The media continue to trumpet inversion of the curve as a reliable warning about recessions to come. After all, the last 2 recessions came about after the curve inverted and the media love to extrapolate easy answers. But the actual warning comes when the curve stops flattening and begins to steepen, regardless of whether it inverts first or not. Inversion or lack thereof is more an arbitrary signal that the financial media fetishize over. It is the direction of the curve and the macro signals implied that matter. The daily view is not really needed, but here it is anyway showing no ill headwinds for the risk ‘on’/cyclical trades. Notice how the February market disturbance was accompanied by a spike the curve. Not so today. Amigo #1 (Stocks vs. Gold) is still intact, but under stress by daily chart. It has not yet turned macro negative. 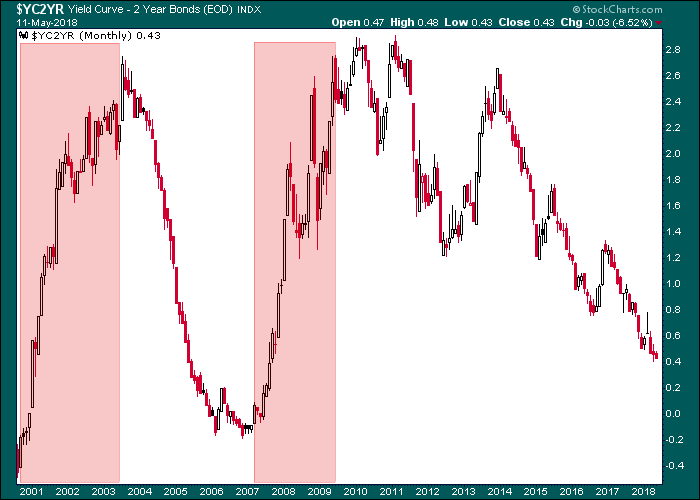 Amigo #2 (Long-term Interest Rates) have arrived at potential limit areas, but these can dwell for months before a resumed uptrend or a failure are registered. But a condition for change, the first condition, is in play. 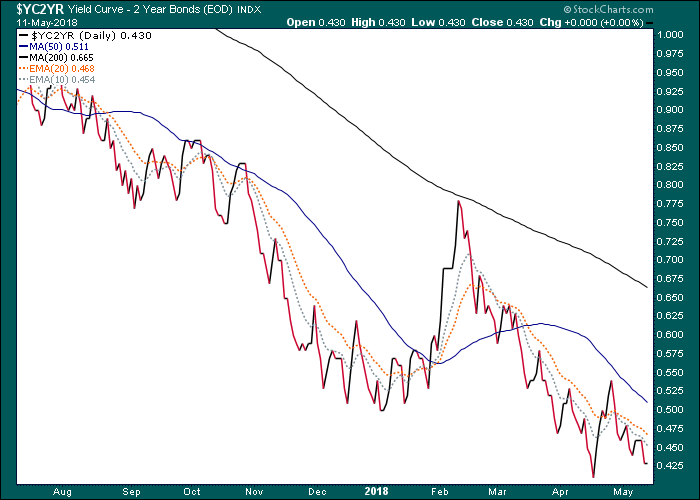 Amigo #3 (10yr-2yr Yield Curve) is still flattening in line with the cyclical and risk ‘on’ trades. While likely much closer to the trend’s conclusion than to its beginning, the macro moves… Bueller? Yes… sloooowly. 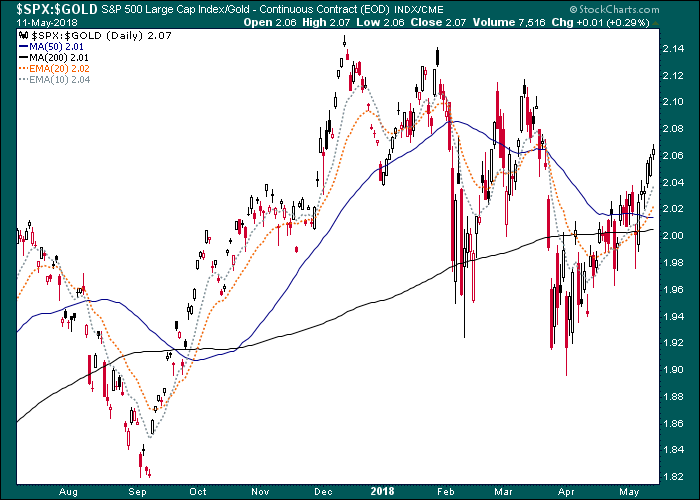 While I hold open continued corrective potential in the stock market, until it and other cyclical items weaken and change trend vs. gold it is a fact that the current trend remains cyclical and risk ‘on’. Even with a harsher correction than that seen so far in 2018 the stock market is leagues above any danger zone beyond a mild cyclical bear potential. See this post of the big picture S&P 500 from earlier in the week. 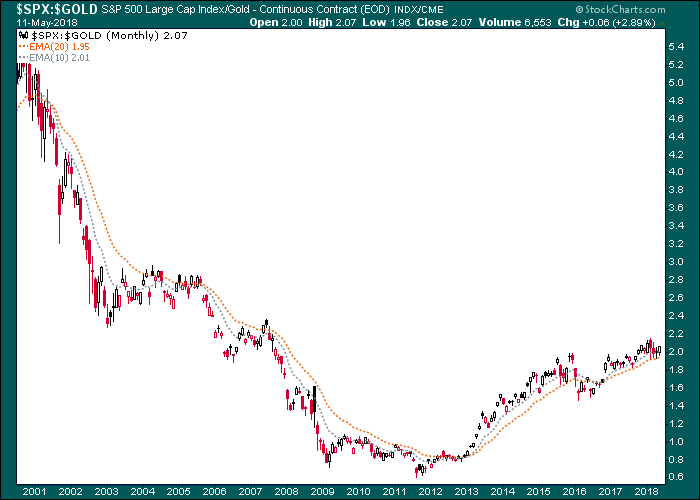 Gold and the counter-cyclical gold sector on the other hand, could be leading the indicators shown in this article by remaining firm (i.e. failing to break down). But a solid fundamental backdrop has not yet engaged and will not engage until many of the trends in play post-2011 are reversed. The Amigos need to reach their destinations and other macro indicators will need to start turning before that is the case.